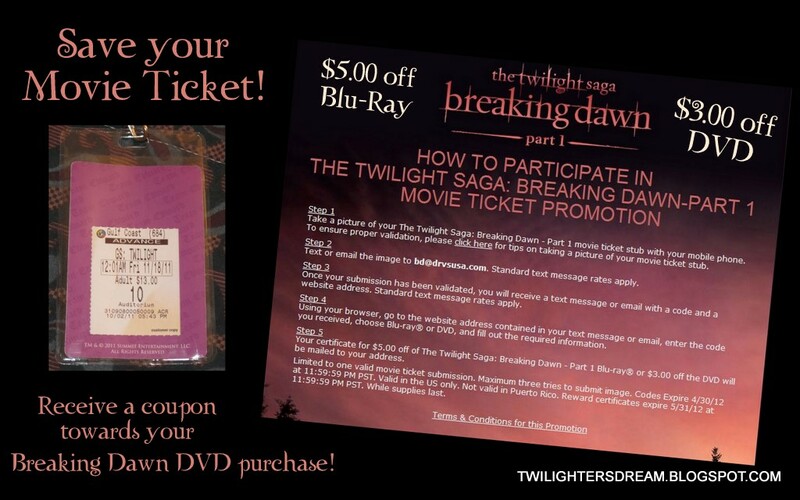 How would you like to receive a FREE COUPON to save $5.00 or $3.00 off your purchase of Breaking Dawn on DVD? Well you can! It's super easy! 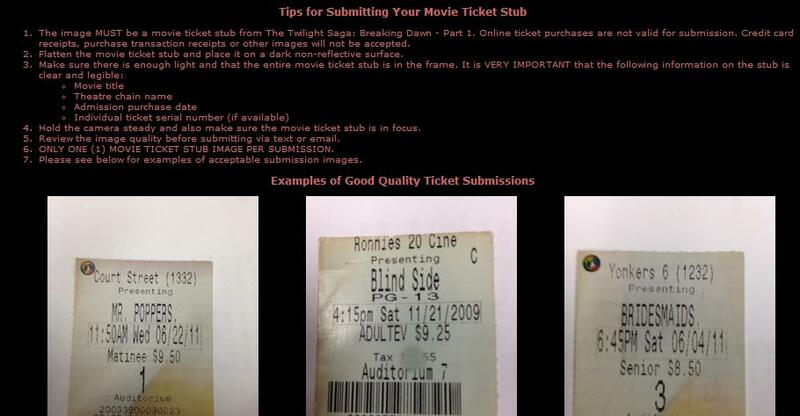 All you have to do is save your movie ticket stub! Take a picture of your The Twilight Saga: Breaking Dawn - Part 1 movie ticket stub with your mobile phone. To ensure proper validation, please click here for tips on taking a picture of your movie ticket stub. Text or email the image to bd@drvsusa.com. Standard text message rates apply. Once your submission has been validated, you will receive a text message or email with a code and a website address. Standard text message rates apply. Using your browser, go to the website address contained in your text message or email, enter the code you received, choose Blu-ray® or DVD, and fill out the required information. 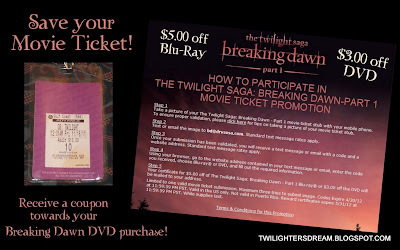 Your certificate for $5.00 off of The Twilight Saga: Breaking Dawn - Part 1 Blu-ray® or $3.00 off the DVD will be mailed to your address. Limited to one valid movie ticket submission. Maximum three tries to submit image. 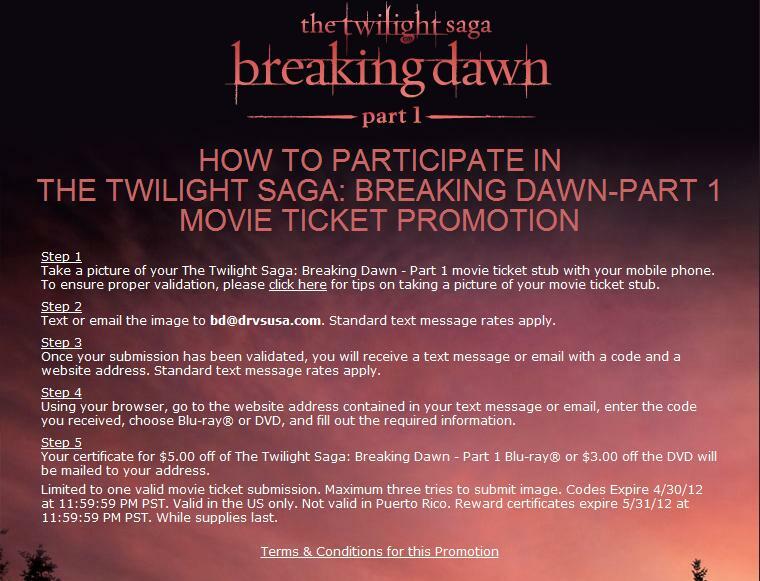 Codes Expire 4/30/12 at 11:59:59 PM PST. Valid in the US only. Not valid in Puerto Rico. Reward certificates expire 5/31/12 at 11:59:59 PM PST. While supplies last. and received my coupon redemption code.